The passports will be issued starting in 2020. 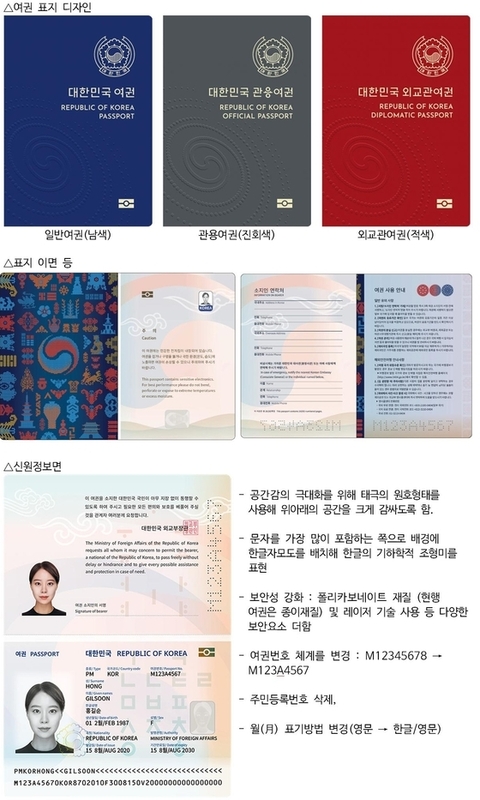 The next generation of South Korean passports will come in three colors — navy for ordinary citizens, gray for government officials and red for diplomats. For enhanced security and greater impact resistance, the ministry said it has decided to use a durable transparent plastic called polycarbonate thermoplastic. The Ministry of Culture, together with Ministry of Foreign Affairs, put forward several designs in October and asked the public for feedback. Friday’s decision reflects the responses they received. The ministries explained that navy blue is a popular color for ordinary passports and is used by 78 countries in the world, including the US, Canada and Australia. Two of Korea’s national emblems, a taegeuk encircled by a stylized rose of Sharon, appear together in the upper right-hand corner of the passport’s cover, and a larger taegeuk is embossed on the lower left quadrant of the cover. Existing passports can be used until they expire, but Koreans can change to the new design even sooner.